The future of solar is (STILL) bright! We believe the tariff was less severe than it could have been and only affects the import of panels, which accounts for only a part of residential installation costs. Experts estimate that the impact of the tariff in year 1 will be between $0.10 to $0.12 per watt. For a typical American homeowner, that represents only a 3% to 4% increase in the cost of a solar panel installation. This increase is still relatively small in comparison to the savings our customers will receive over the 25+ year lifespan of their systems. 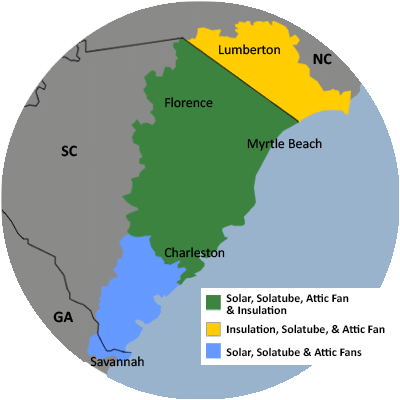 The 30% tariff DOES NOT mean that the federal government is discouraging solar, they are still offering 30% federal tax credits on solar system installations along with the 25% state tax credit in South Carolina.....these incentives far outweigh any increase in panel costs. And, the first 2.5 gigawatts of imported solar cells are exempt from the 30% tariff each year. The 30% tariff is not here to to stay. In fact, it is set to phase out each year by 5% over the next four years.... this means that the first year the tariff will be 30%, next year the tariff will be 25%, the following year it will be 20%, and so on...The end result is that the percentage-based tariff, will be even smaller when applied to ever-decreasing module costs. The goal is to increase American manufacturing. There is some concern about the tariff having the opposite effect on American solar companies but we are also already seeing an increase in U.S. investment by non-American manufacturing companies. Jinko Solar just promised to bring 800 jobs by building a $410 million Florida manufacturing plant. Many companies are already inquiring about exemptions from the tariff. Exceptions up for discussion include SunPower products, which are the highest efficient panels available. South Korea is also in discussions to be exempt from the tariff due to the type of solar cells they manufacture. In a statement released by the U.S. Trade Representative it says: "The U.S. Trade Representative will engage in discussions among interested parties that could lead to positive resolution of the separate antidumping and countervailing duty measures currently imposed on Chinese solar products and U.S. polysilicon," the statement reads. "The goal of those discussions must be fair and sustainable trade throughout the whole solar energy value chain, which would benefit U.S. producers, workers, and consumers." Overall, we expect our suppliers to continue to adjust to the anti-dumping measures imposed on Chinese solar products, which started back in 2012. While there may be some increase in pricing, it should not materially affect our customers’ savings. Carolina Energy Conservation is dedicated to minimizing any economic impact of this tariff on our customers. We are still optimistic about the future of the solar industry and believe you should be too! If you're considering solar, and are worried about the tariff, be sure to GO SOLAR NOW and lock in current pricing before the tariff takes effect.